Ages 3-4 Pre-Kindergarten Wooden Unit Blocks Booster Set for homes, home schooling, home-based childcare, or family unit block play with 55 blocks in 11 block shapes specifically designed to support construction, tactile learning, and dramatic play for children ages 2 and up. 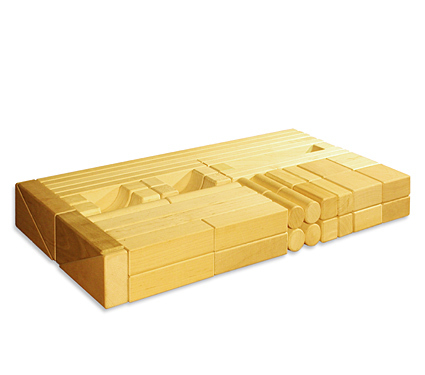 As with all our wooden blocks, this set is infant- and toddler-safe, suitable for ages 6 months and up. They are completely free of borates, pesticides, and fungicides commonly added to rubberwood after harvest. We use only 100% Hard Rock Maple. We manufactured on demand in the United States from Custom Milled FSC®-Certified Hard Rock Maple. Each block is accurately cut to within half of 1/100 of an inch. This 55-block set adds more of the smaller unit block shapes and specialty shapes (like arches, planks, and pillars) to support more complex building block contructions and micro-dramatic play. How our Standard Unit Wooden Blocks grow with your child. Start Your Unit Block Gift-Giving Tradition — Give Unit Blocks. Option 1: Buy one set and then add 4 large Unit Block Booster Sets over the next 4+ Years. If your child is a little older, you can start with an Introductory Family Set and still get create a meaningful annual holiday or birthday tradition. When you are done with any of the above purchase options, you’ll have a full CP61 Quarter Classroom Unit Blocks Set + RX10 Quarter Rx Unit Block Set. 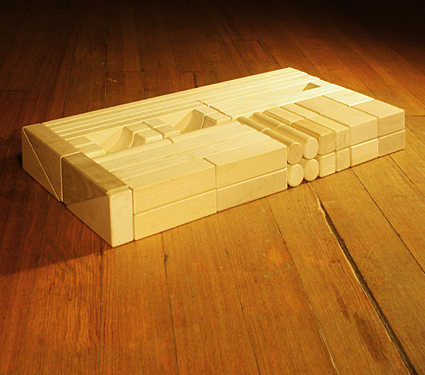 Our CP02 equals our own RX10 Quarter Classroom Rx Unit Blocks Set (55 blocks, 11 shapes). They are identical, both made with FSC®-Certified Hard Maple.